February 14th is Ash Wednesday this year. We should all go out to eat on Valentines Day with ashes on our foreheads. I mean, whether you’re a Christian or not, you should go ahead and do it. Because Ash Wednesday is a day that speaks a deep truth about humanity that we all try to avoid: we’re mortal and flawed. So no matter what kind of foundation you gussy yourself up with before that first date, and no matter what kind of aftershave you apply to make that skin smell just so-so fine, you can’t change the fact that we all share the same mortal boat. And I don’t say this so that you will despair. I say it just out of honest truth. Look, give your heart away to worthy things, but often times what makes them worthy is that you give your heart to them in the first place. When I speak to couples about love and companionship and sometimes even marriage, I have to work hard to cut through the syrup and sentiment to arrive at something real at the bottom of it all: love is often, in the end, a choice. Sure, it starts out as butterflies and pie in the sky, but once that wears away you will see what Ash Wednesday shows us: the flaw, the scar, the thing that was covered under foundation and aftershave, years of perfecting a story that omits a chapter, and hours of therapy. But it is there, that flaw is there, and that is OK.
Do you hear me? That is OK.
Because you cannot give your heart to something perfect; there is no such animal…at least not one immediately available. You certainly are not perfect. And sometimes, Beloved, all it takes is a little love to make the dead places in us rise from the grave. Scars fade. Flaws smooth. Just because something is dead in this life does not mean it will always be dead. And nothing is ever perfect, mind you. Even Jesus’ own resurrection came with scars from the hurt and the pain of the fight two nights before. But that body walked again, by God. This year we have this fun juxtaposition: Cupid and Christ. Cupid blindly shoots and we romantically think we fall in love. Christ, though…well, Christ’s love isn’t blind. God’s love isn’t blind to all our hurt and pain and wrongs and ego and all that mess. Christ’s love is visionary, illuminating all those shadowy parts of ourselves, exposing them for what they are: flawed but not fatal. And that person you fall in love with? Perhaps we should stop imagining Cupid shooting blindly and start embracing a Divine love that sees all and still finds a way to keep the arms open, the welcome present, the love intact. Not that you have to fall in love with someone to be whole. And even more so, sometimes the love we thought would last does not…cannot. Sometimes our flaws do push us apart in the end. Which is when we need to lean even more into the story of Ash Wednesday and a Christ whose love is visionary and completing (rather than competing). Because it is not a flaw to not be partnered. Sometimes it is a calling. And it is not a flaw to be divorced. Sometimes it is a necessity. But when it all feels like a flaw, keep in mind that the deep truth of everything is that it has an expiration date. Feelings, life statuses, and even life itself. Things will not always seem and be the way are today. So embrace the truth of the situation: we are dust. Glorious star dust, the stuff of the cosmos, wonderful and beautiful and sparkling, and yet, dust all the same. So risk the date, fall in love, eyes wide open. Or be single and loving it, giving your heart to many other worthwhile things. But remember that things aren’t worthwhile because they are perfect; often they are worthwhile because you love them. Because you and I are not perfect, and yet we are loved by God. And others. So, I hear “I’m marrying my best friend”…and I cringe just a bit. It’s said honestly, and I don’t mean to belittle the sentiment at all. But, just in time for V-day, perhaps knowing that you don’t have to share your bed with your best friend will provide some comfort to someone. 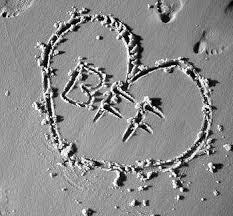 My best friend and I would never write in the sand. Probably.little bit. And I’m not against you and your partner being, in some ways, friends. Or even “best __________” in many ways. But I do not think that you must (or maybe even should) be “best friends” with the person you marry. You need to be great partners. You need to be great lovers. You need to be great confidants and plan out a common trajectory. But you need a different best friend. “All-needs-met” is the syndrome where one, or both persons, in a relationship feel that all their needs will be met by this one person, in this one relationship. And it’s just not going to happen. Sexual needs, deep emotional needs, partnership needs…these can be met within the marriage unit. But many friendship needs can’t, and probably shouldn’t, be met there. Because you need to dance well together. And the couple gave such a look to the woman and to one another, you’d have thought that lobsters were crawling out of the interviewer’s ears. They had a deep bond, an emotional bond, and they spent a lot of time together working hard at their craft, laughing, joking, crying, helping one another up, and making beautiful movements gliding through this world. But they weren’t best friends because they needed to dance together, and to do that well, they couldn’t be best friends. The term “best friends” probably has a different meaning to most everyone, I think. So perhaps the confusion is on my end. I may not need to cringe when I hear it. But, then again, perhaps it’s just a truth that needs to be named: you don’t need to be best friends to be married. In fact, maybe you shouldn’t be. The marriage covenant is deeper than friendship. And your marriage cannot meet all your social needs. It shouldn’t meet all your social needs. Because you need to dance with intimacy and having/being a family and setting a common life trajectory and, well, a complex support system needs to surround you because those things are hard enough without trying to throw “being besties” in there. And I think this confusion lies especially within the church who often sets marriage up as the container that holds all relational meaning. The church has set marriage up on this pedestal, has made it the culmination of everything and all things, and doesn’t mention enough that marriage is a call that not everyone feels, and that marriage will not satisfy every human longing within the heart. We all need friends, I would say “best friends,” outside of marriage. And we all need to know that that is OK. It does not make your marriage anything less to say that your spouse is not your best friend. They are more important than that. They are your partner. They are your lover. They are your family. They don’t have to be your bff even if you have covenanted to be together forever. Because you have to dance together, and even in dancing you need a certain amount of distance between the people to do it well. 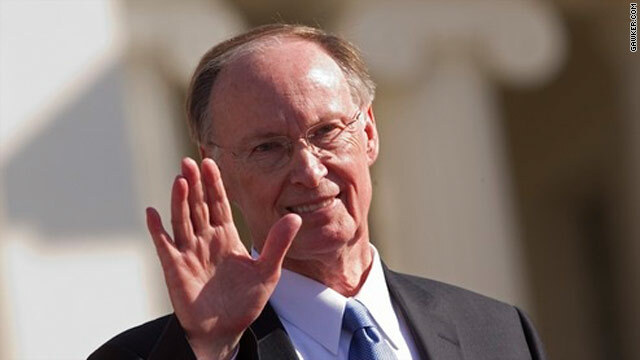 Governor Bentley waving to people who may or may not be "brothers and sisters." Sometimes rolling your eyes just isn’t enough; sometimes you have to slam down the paper. That fact alone makes me wish the news cycle of Alabama Governor Robert Bentley‘s inane comments on what constitutes “brothers and sisters” in a Christian context wasn’t on CNN.com. For one, I can’t slam my computer on the desktop. It harms my computer. Secondly, I fear more people read CNN.com than traditional papers nowadays. Which means there is one more example from the clowncar of the public Christian tumbling out. But the fact that Governor Bentley doesn’t consider those who haven’t “accepted Jesus Christ as their savior” as a sibling doesn’t irk me half as much as the underlying theological claim. Namely, that somehow accepting (defined loosely) Jesus Christ (again, loosely defined) as a savior (again…well, you get the picture) has some sort of theological bearing. Before you stone me, have a seat to analyze that statement. First, what does it mean to accept something? Do you assent to it’s veracity? Is it a mental construction, much like I accept that the number 2 is Real, and yet can’t produce the number 2 purely? Or is something only accepted when actions flow from its internalization, much like I accept that the fact that I have a goddaughter requires a response on my part to her faith life? And if I accept a concept, how can I really tell if I have truly accepted it? That question alone leads me to my next point: which Jesus Christ? Is it the “historical Jesus,” the 160lb Jewish guy who walked out of Galilee? Or is it the “Christ,” the a-sexual salvific presence that God has called us into communion with? Or is it, perhaps, the Jesus as purported to in various Scriptures who occasionally knows who he is, but more often does not? Is it the crazy Rabbi of John or the prophecy fulfiller of Matthew? Which Jesus? Sin might be an answer. But are we talking about the beautiful definition of Sin provided by Luther, this lovely navel-gazing, or are we talking about the sins of John Edwards (the theologian, not the politician…although perhaps the Edwards of the 18th Century might have a thing to say about the contemporary Edwards as well)? Or are we perhaps talking about communal sin? I say this not to provide a loophole for relativity, but rather to allow for complexity. Governor Bentley talks of unification, he longs to have “brothers and sisters,” but only if they conform. He talks of unification, but paints a picture of divorce. Those who do not think as he thinks are cut off from him in a very real way. Where is the sibling nature of a shared humanity? Where is the sibling nature of a shared state of being?! And divorce of this sort is dangerous. It’s fundamentalism. That is Christopher Hitchens from God is Not Great. It probably goes without saying that he considers a good bit of the population to be divorced from himself as well, not brothers or sisters, because they assent to something other than his definition of reason or science (both of which are narrowly defined). Two sides of the same coin. Both turn my stomach. Both are as simple as can be…and both smack of divorce. I’ve seen it in my own church as local congregations have splintered off into estrangement over sexual identity discussions. Obviously “accepting Jesus Christ as your Savior” isn’t quite enough…you must accept the Jesus that dislikes gays. And with that, I’ll sit down as well.